Currently in the midst of an ongoing US tour, London's Wolf Gang have also opted to drop their new single into our welcoming arms. 'Lay Your Love Down' follows the excellent recent cut 'Ghost In My Life', and is another huge-sounding, hook-laden pop effort. Listen to an acoustic version of the latter track, along with the latest single below. 'Lay Your Love Down' will be part of the band's forthcoming second album, produced by Flood (Mark Ellis to his mam) - an album we're increasingly looking forward to. We're also hoping that Wolf Gang can match some of the success achieved by previous Flood collaborators who include U2, The Killers, PJ Harvey, and Foals. 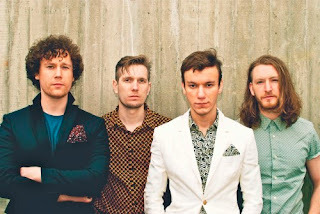 Find more info about the band's tour and single at wolf-gang.co.uk.